Couldn't get the teaching degree in enough time to keep money coming in, so I've moved on to dream #2 - driving OTR. Signed up last week and already have a week of classes under my belt. Started backing trailers - omg more difficult than I ever imagined. Anyway, hopefully I'll be able to sign on with a company soon and then get my move to Oregon completed. Then it's off on the road where maybe I'll get a chance for a cup of coffee with some of my friends here. good luck with the driving/ I know teaching is a tougher job. I'm a teacher. My brother is a trucker. He makes way more money, but my job is more rewarding in so many other ways. I can't say which is the tougher job, but I know I "live" my job way more than he ever has - teaching is 24/7. I wish you the BEST of everything in your new endeavor. It is a very difficult job, but you're a Badger, so I know you'll excel! I try to tell EVERY trucker I meet "Thanks for bringin' me my 'stuff'", 'cause it is a thankless job in many ways. Remember to keep the 'shiny side up' and watch out for the 'four wheelers'. Bruce and I would love to have a cup o' joe with you too! Hey, Greenleaf, best of luck to you in your career as a truck driver. I'm reading a book right now about a Buddhist cab driver (which, like a truck driver, obviously involves long stretches of sitting and driving), and my one word of advice to you is keep VERY close eyes on your health. It's easy and tempting to eat a lot of fast food drive-through, drink way too much coffee (and other caffeinated products), sacrifice your sleep, and not get any exercise. Before you know it, you'll be looking at yourself in a mirror 20 to 30 pounds heavier ... not to mention what's possibly taking place internally -- i.e., arteries that are clogging up, and adrenal glands that are burning out, and whatnot. So remember to take care of yourself out there on the road. I hope you'll be happy with your new job, everything has it's bas and good sides, good luck ! It always seems right when I see a bearded guy behind the wheel of a big rig. Hope the new career works out well for you! 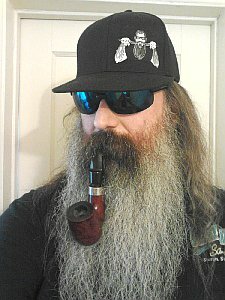 Support your local cigar smokin', whiskey drinkin', big bearded biker trash! > of a big rig. Hope the new career works out well for you! Just the other day I heard a radio commercial from a trucking company trying to recruit new truckers. "We only hire 'clean cut' drivers. If this is you, and you want to succeed, give us a call." (Or something to that effect). It made me mad hearing it.